a. A car is moving eastward along Lake Avenue and increasing its speed from 25 mph to 45 mph. b. A northbound car skids to a stop to avoid a reckless driver. c. An Olympic diver slows down after splashing into the water. d. A southward-bound free kick delivered by the opposing team is slowed down and stopped by the goalie. e. A downward falling parachutist pulls the chord and rapidly slows down. f. A rightward-moving Hot Wheels car slows to a stop. 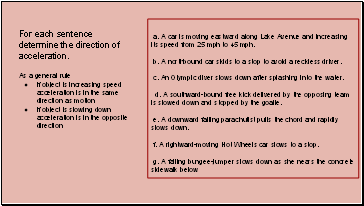 For each sentence determine the direction of acceleration. 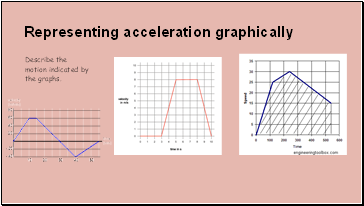 Describe the motion indicated by the graphs. 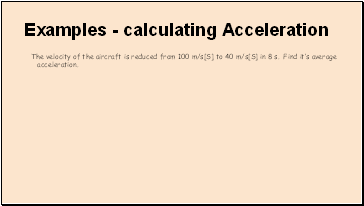 The velocity of the aircraft is reduced from 100 m/s[S] to 40 m/s[S] in 8 s. Find it’s average acceleration. A truck is moving east at a speed of 20 m/s. 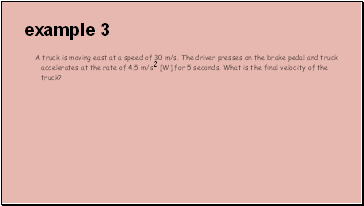 The driver presses on the gas pedal and truck accelerates at the rate of 1.5 m/s2 [E] for 7 seconds. What is the final velocity of the truck? A truck is moving east at a speed of 30 m/s. The driver presses on the brake pedal and truck accelerates at the rate of 4.5 m/s2 [W] for 5 seconds. What is the final velocity of the truck? use vavg - ½(vi + vf). 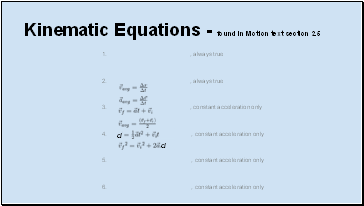 this only works if acceleration is constant and uniform. 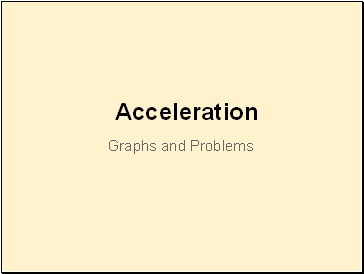 A car is moving at +25 m/s. 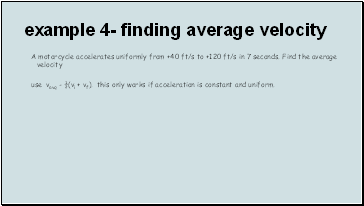 It then accelerates at a rate of 1.5 m/s2 for 10 s. Find it’s final velocity.